This image is from the "Taruveda" Cafe in Jaipur. I frequently visit different Coffee outlets in town and Taruveda is one place that I really like. I likes the vibes there, artsy and spiritual. When you enter, you also have a Buddha Statue at the stairs and inside you have a lot of work created by the local artists on display. The artists work primarily consists of home decor and paintings. I usually take the balcony seat as from there I can see the sun going down. No, I do not take the seat to shoot the sunset. I like the rising sun instead. So one Sunday, I was at Taruveda Cafe sitting at my balcony seat with my Camera. I ordered a Cold Coffee and some Garlic Pizza Bread. I love Garlic and yes Garlic deserves a capital "G" whereas sunset doesn't deserve a capital "S" for I don't like things that are nearing their end. I was having a hard day as it was a Sunday and that's my photo shooting day. I had not got any worthwhile shot since morning. I have this habit of picking up my camera and pointing it randomly at places looking through the viewfinder. When I was just about to keep my Camera down and put the lend lid back on the lens, I got a glimpse of this Twisted Blue Straw popping out from my Empty Cold Coffee Glass. Yes, it was Blue and that caught my attention. What also caught my eye were the curls/ curves or the twirl or twist in the straw, whatever you may call it. 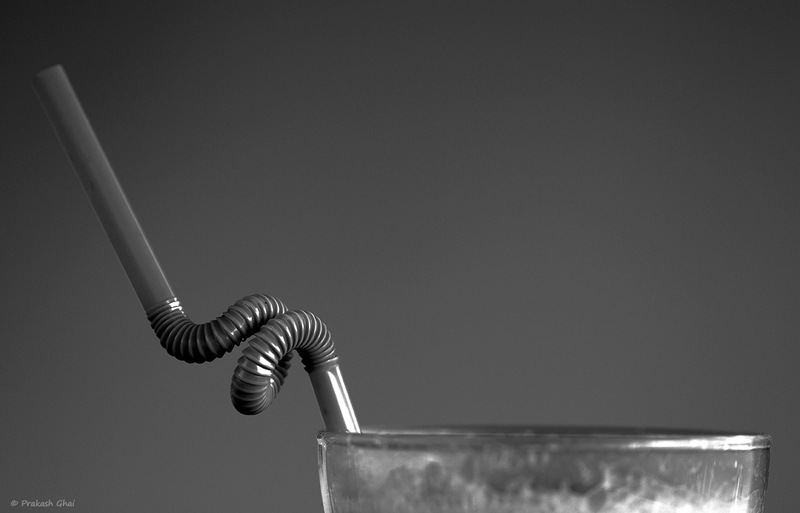 So, once the Twisted Coffee Glass Straw got my attention, I decided to click some shots. I quickly remembered the "Parts of the Whole Minimalism Type" from the Minimalist Photography classifications and tried to incorporate that in my Shot. To execute "Parts of the Whole Minimalism", I shot only the top rim of the Coffee Glass (a part of the whole), with the straw going to the top left on the frame. Later, during editing I converted the photo into black and white. PS: even the straw is not shown completely, so that is also a "Part of the Whole". Parts of the Whole Minimalism creates a sense of Mystery and make the viewer complete the Subject/Object in his/her imagination. That's the beauty of this Type of Minimalism. Hope you liked the Shot above. Do leave feedback/ your views if any about the Photograph.